Hiding leftover bones or treats is a natural canine survival instinct. Most canine rituals that people find strange come very naturally to dogs because they have been written into the genetic code that dictates their behavior. Following in the footsteps of their wild dog ancestors, many of today’s domesticated dogs are compelled to hide or bury their bones and other treats. In the wild, dogs did not have the luxury of human caretakers to provide their meals, so they were forced to hunt for nourishment. Survival instincts drove wild dogs to bury uneaten portions of their prey to ensure that they could enjoy another meal before the next hunt. Though dogs have been domesticated for thousands of years and now receive regular meals from their owners, the compulsion to hide or bury surplus food remains strong in many dogs today. Scarce food supplies left wild dogs to face intense competition over prey from members of their own pack and from other predators. Hiding or burying leftover carcasses helped wild dogs to protect their loot from other thieving predators. While most domesticated dogs do not have to compete for their food any longer, many are still inclined to hide their spoils. In some multiple dog households, however, the competition over food and treats may still be a reality. The canine instinct to hide or bury bones is also known as hoarding. In the wild, dogs faced frequent food shortages that threatened their survival. Since wild dogs never knew when they might face another food shortage, hoarding bones and any other excess food available to them was an effective survival strategy. Burying bones and food also helped wild dogs preserve their spoils by keeping it at cooler temperatures and protecting it from flies and other insects. Domesticated dogs continue the practice of hoarding because it comes naturally to them. Some dogs seem to hide their bones because they enjoy the activity. The digging behaviors used when hiding bones and other treats can be a good source of entertainment for dogs who are bored or need to release pent up energy. Dogs sometimes hide their bones in inappropriate places or damage yards by digging holes in which to hide their loot. Designating specific areas where hiding or digging is acceptable can help keep a dog’s natural instincts under control. Pedigree: All Things Dogs - Why Does My Dog Hide His Bones? Sarah's Dogs: Why Do Dogs Bury Bones? 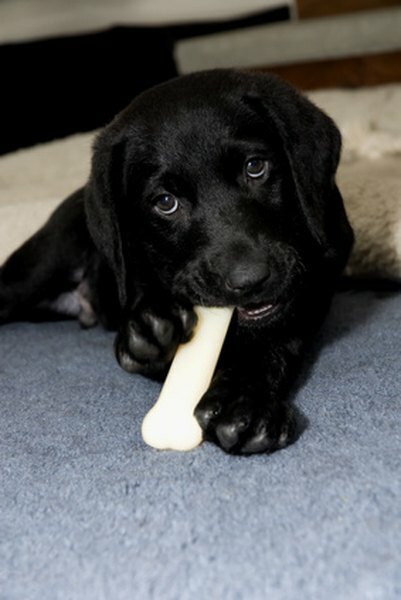 Pet Place: Why Do Dogs Bury Bones? Do Cats Hide Pain Well? Will a Cat Play & Eat If It Is Sick?